All humans in this world can use the power of the light of mana, and those who can't are considered to be subhuman 'Norma.' The world is like a peaceful utopia, and the celebrated princess Angelize leads a happy life. She believes that the only darkness left in the world is the existence of the horrible Norma. However, in a ceremony on her 16th birthday, the truth is revealed--Princess Angelize is a Norma. Now she is going to learn what her society does to Norma. She is sent to an isolated island full of others like her, who are taught that the only reason they are allowed to live is in order to fight to protect the peace of this world. Now "Ange" is part of a squad that pilots Paramails and fights invading extradimensional dragons. Domino Kick - Naraberareta Domino o Kick Shitara Dou Naru no Kashira? Follow the life of Ms. Sae as she fights her catastrophic impulses to break the solemn mood of serious situations and her butler, Himemori, who will sacrifice himself in order to protect Sae from herself. Her impulses range from shouting out obscene words during exams to drawing a picture of feces for her school art homework. Every time, Himemori is there to be the buffer between Sae and her unquenchable thirst for chaos. Ando Hanaka wanted to become stronger because she thought she couldn't protect her friend from bullies. Now as she enters high school, she seeks to enter many of the martial arts clubs in her school. Unfortunately for her, many of the clubs reject her due to her frail and small size. She just wants to be stronger, but is it going to be impossible for her? 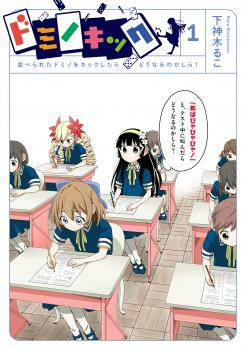 All of this changes as she encounters her classmate Yoshino "Koha" Koharu. Koha introduces Hanaka to the world of MMA. Hanaka learns that martial arts is designed to make the weak stronger. Her aspirations of becoming stronger may come true as she ventures into the world of mixed martial arts. Amano Chiharu goes to a school where students are assigned into couples, in order to learn how to become good husbands and wives. Many pairs end up actually getting married after their school years. However, Chiharu's 'husband' broke up with her in their third year, saying that she talked too much about games and was useless at being a wife. Chiharu decided that she didn't need a husband, and that she would pursue her dream of making games. Then one day, Kasaki Kaname, a younger student in her school, became her new partner. She tried to keep him at arm's length, but he was very determined that they would become an actual couple. Chiharu is into younger men, and though Kaname doesn't look younger than her, she likes how he sometimes looks up to her for guidance. Also, since Kaname was born and raised in America, he has no problem with the idea of Kaname pursuing her career dreams after their marriage. Could Chiharu's second 'partner' really be the one for her? My favorite this week was "Kyou Kara Anata wa Boku no Yome". The main characters are pretty cute together. Cross Ange already has an anime, and its a pretty fast-moving story. 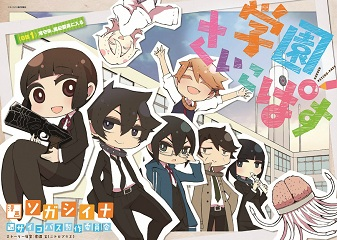 Psycho-Pass Gakuen would be good for anyone who is interested in the idea of a chibi school-life version of Psycho-Pass. 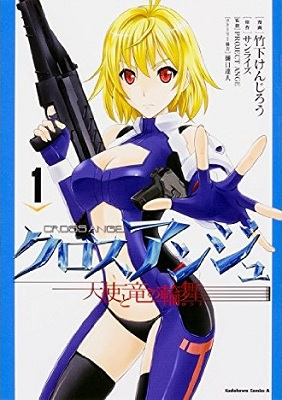 Cross Ange - Tenshi to Ryuu no Rinbu - If you're into mecha manga with some yuri thrown in, then you should take a look at this manga. Domino Kick - Naraberareta Domino o Kick Shitara Dou Naru no Kashira? 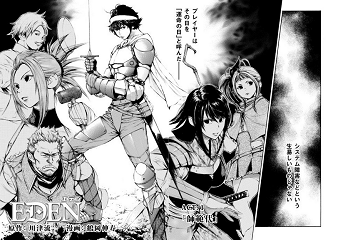 - If you like Domino Kick and want more, then you should check out this manga. Eden - If you like MMOs and the idea that you have to fight for real for survival within the game, then this may be your cup of tea. Gakuen Psycho-Pass - Another manga spin-off like Domino Kick, if you like chibis and want more Psycho-Pass, then this is a must-read. 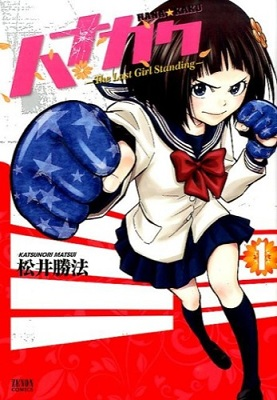 Hanakaku - The Last Girl Standing - Although the premise isn't new about a girl learning MMA, if you want a strong girl lead and/or like MMA manga, then you might like this manga. 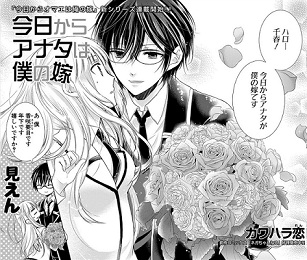 Kyou kara Anata wa Boku no Yome - If you're in the mood for shoujo romance, and are interested in the idea of a girl game maker, then this romance manga is for you.